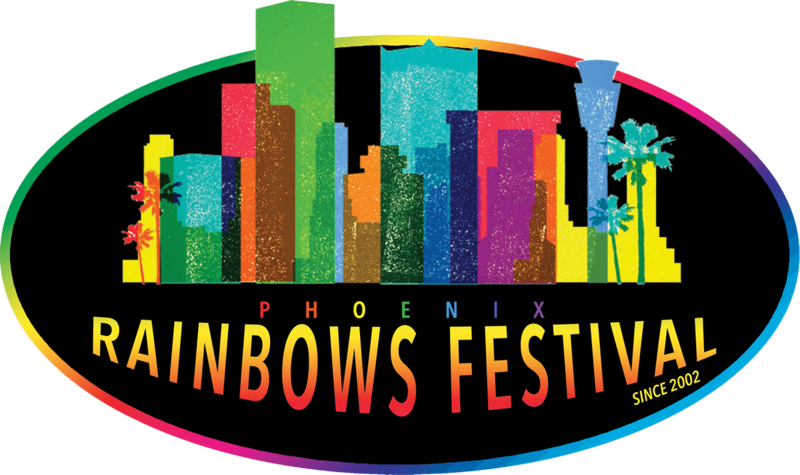 Phoenix Pride is the proud producer of the “Arizona’s Greatest Street Fair”, the Rainbows Festival. The annual Rainbows Festival & Street Fair is a celebration of the diversity of the LGBTQ community. The event is located in historic Heritage Square Park in Downtown Phoenix. Each year, the Rainbows Festival draws a crowd of over 25,000 friends, families, and allies. Rainbows Festival is the 2nd largest LGBTQ event in the state of Arizona, only 2nd to the Phoenix Pride Festival. The annual Rainbows Festival is a free event open to the public. We host over 150 exhibitors and sponsors throughout the two-day event and have 2 stages filled with entertainment throughout the weekend. Any food and drink, with the exception of one UNOPENED bottle of water, any size. EMPTY reusable bottles are permitted. The 2018 Rainbows Festival Exhibitor Application is now open! Please click on the following to apply for General Exhibitor. Applications for Food Vendors are closed. The 2018 Rainbows Festival Entertainment Application is now open! The 2018 Rainbows Festival Volunteer Application is now open! Lost items can be picked up at the Phoenix Pride Customer Service/Information booth located near the corner of 6th Street and Monroe. After the event, you can contact Phoenix Pride at 602-277-7433 to inquire about any lost and found items. All Exhibitor Booths are wheelchair accessible and ADA Restrooms are available throughout the Festival. ASL (American Sign Language) interpreters will be available at the Bud Light Main Stage and Community Stage for all performances. There will also be an interpreter at the Information Booth at 6th Street and Monroe for assistance. WE HAVE A ZERO TOLERANCE FOR FIGHTING AND ILLEGAL DRUGS! While pets are allowed at Rainbows Festival, pets must be on a leash at all times. Be advised that the Rainbows Festival site is very small and gets very crowded. It may be difficult for pets to maneuver through the crowd. We strongly recommend you consider these conditions when deciding whether to bring your pet. Owners are REQUIRED to pick up after their pets. Any violation of this policy will result in the pet and owner being asked to leave the festival. Please bring your own bags to pick up after your pet. We ask that you also take into consideration the temperature during the weekend. If the ground burns your feet, please assume it is burning your pet’s feet too! We want your pets protected! Parking meters are available around the entire festival. There are many nearby paid parking garages. Three of the largest and closest garages are listed below. – The Heritage Square Garage located at 123 North 5th St (5th St & Monroe) is $12.00 per day and is attached to the festival. – The Phoenix Convention Center East Garage is located at 601 East Washington St (6th St & Washington) is $12.00 per day and has access to the festival via an over-street bridge to the Arizona Science Center & Heritage Square Park. – The Jefferson Street Garage is located at 333 East Jefferson St (3rd St & Jefferson) is $5.00 per day. The Phoenix Metro Light Rail stop for Eastbound trains is 3rd St & Jefferson. The stop for Westbound trains is 3rd St & Washington. If you would like to utilize a taxi, please use Phoenix Pride’s preferred taxi service.